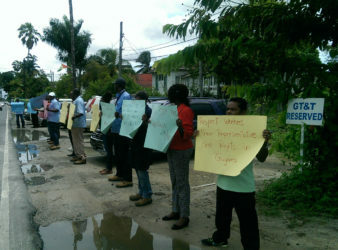 Calling on the Chief Executive Officer (CEO) of the Guyana Telephone and Telegraph (GTT) Company to engage them in talks over changes in the company, GTT workers represented by the Guyana Postal and Telecommunications Workers Union (GPTWU) staged another protest yesterday. President of the Union Harold Shepherd said that since their last protest on June 16, the company has not come to them to discuss the changes in their working conditions. He said that what they have heard through the media is that the company was willing to engage in talks at the bargaining table. “How could they have said this publicly and not communicate this with the union, even to date” Shepherd queried. According to the union’s president the only word he received from the company was a letter proposing closure of one of GTT’s branches. This, Shepherd said, was another issue he plans to write to GTT CEO Justin Nedd about. Nedd had said in a statement that their employees have the right to voice their issues and concerns, but since GTT was about to commence Collective Labour Agreement discussions it would not engage in dialogue while at the bargaining table. “GTT will not sway otherwise,” he said. GTT workers protesting yesterday in front of its Head Office at Brickdam. According to Shepherd, the issues affecting the workers are numerous and GTT is continuing to treat its workers unfairly especially with no official word of when talks would begin, hence the second protest. He said the company recently sent letters to workers informing them that their pay slips will be sent out via email. This, Shepherd said, is a serious issue since some of the workers need their pay slips to acquire bank loans. Moreover, employees who do not have access to printers and an email account will be affected. Apart from this, he said, the company has also demanded that just one technician be sent to problem areas without support. Shepherd said the technician will have to drive himself to the area, fetch his own ladder and secure the vehicle all by himself. He said that although the company has demanded this of technicians it has not increased their salaries. Shepherd also raised the issue of GTT cutting off providing transportation for workers and not regularizing temporary employees to permanent so that they could be eligible for pension benefits. Shepherd also raised an issue that he said that has been a problem for years, and which he hoped would have been solved during the course of the day – the request of arbitration for early retirement for GTT employees who are 55 years and over. He said the Department of Labour in the Ministry of Social Protection had called for a meeting to discuss the matter later on yesterday. Regarding this same issue, Shepherd said that GTT had ignored the ministry’s request to stop sending off employees and had sent off over 25 workers. Shepherd said he is calling on the government to look into the matter, since he believes the Department of Labour has become ineffective. According to him, over the years, the ministry has asked them to go back and to discuss the issues as a part of management which he felt has dragged out the process and taken them back to square one every time. The union president said he recognised that some of the issues will take some time to be resolved, but GTT as a company should ensure that they are dealt with quickly. Shepherd said that if talks do not begin immediately between the union and the CEO, they will protest as long as it takes to get the message to GTT. “The CEO has been speaking to us through the press and not directly to us. If these grievances are not resolved quickly, other forms of industrial actions, and other strategies will be applied,” Shepherd said.